Tires are one of the most commonly found items during CRC’s annual Source to Sea Cleanup. 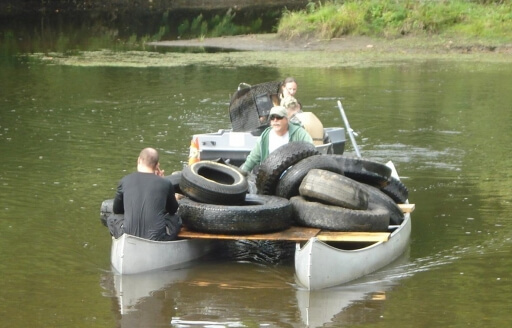 Over 10,000 tires have been removed from in and near our rivers in the 22 years that volunteers have been cleaning up the Connecticut River basin. It’s time that tire manufacturers take greater responsibility for the recycling and reuse of the tires they generate. Pushing the disposal cost of tires to consumers is a recipe for illegal dumping. Read on to learn more about trash tires. How many waste tires are generated each year? It is difficult to estimate how many tires are recycled or reused rather than become waste. 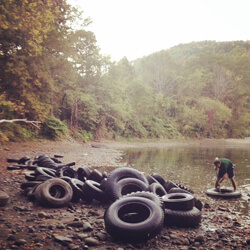 A 2002 report from the Northeast Waste Management Officials’ Association (NEWMOA) estimates there are 610,000 waste tires in Vermont, 1.2 million in New Hampshire, 3.4 million in Connecticut, and 6.4 million in Massachusetts. How are tires disposed of currently? A 2002 report from the Northeast Waste Management Officials’ Association (NEWMOA) notes that within New England, most current waste tire generation is used as fuel, typically at paper mills in Maine. Massachusetts and New Hampshire prohibit whole tires from entering landfills. Connecticut and Vermont prohibit tires in landfills, either whole or in pieces. JP Routhier, a tire shredder in Littleton, MA operates the only tire recycling facility in the four Connecticut River states. What are other options to manage waste tires? A 2002 report from the Northeast Waste Management Officials’ Association (NEWMOA) notes that, other than use as Tire Derived Fuel (TDF) the most promising market for high volumes of waste tires in New England states is civil engineering applications. A major benefit to substituting tire shreds or chips for traditional gravel, stone, or soil in civil engineering applications is that the unit weight of tire chips is substantially less, reducing transportation costs and increasing the ease of placement in many cases. The civil engineering applications that are currently being implemented in some locations that consume the largest number of waste tires are highway and landfill construction projects. House foundations and septic system installations are also current uses for waste tires but the potential quantities are smaller. In Connecticut, paving business has told policymakers that they would like to relocate to the state if they create a product stewardship policy in Connecticut. According to the Scrap Tire Management Council, there is a reluctance to incorporate used tires into new tire production due to the public’s perception that tires with a recycled content would be less safe than tires made completely from virgin material. What can be done to reduce the number of waste tires? Currently, fees are charged to dispose of tires. This places the financial burden and responsibility of proper disposal on the consumer. This is a recipe for illegal dumping. The best solution is for tire manufacturers to take more responsibility for the proper recycling and reuse of waste tires they generate. We advocate for widespread Extended Producer Responsibility (EPR) programs, which lead to free, easy disposal of tires and eliminate or reduce the incentive for illegal dumping. EPR programs have been successful across the country and the world to turn waste into a reusable commodity. These programs also include advanced market development, which can increase the value of post-consumer materials and provide opportunities for economic development. With producer-provided cost-internalized funding, EPR offers an effective, sustainable financing system that can increase the collection and recycling of leftover tires, reduce government and overall costs of tire management, encourage market development for scrap tire material, and lessen environmental impacts. While the U.S. does not yet have a legislated EPR program for tires, such programs have been successfully operating in Canada since 2007. Both Connecticut and Vermont have introduced tire EPR bills in recent years. In Connecticut, business has told policymakers that they would like to relocate to the state if they create a product stewardship policy in Connecticut. Connecticut Department of Energy and Environmental Protection did a study on scrap tire management in Connecticut that included investigation of management strategies and determined that a producer responsibility program would meet its scrap tire management needs. Tire companies have also pursued voluntary product stewardship initiatives to lessen the environmental and public health impacts of their products. Bridgestone, for example, recycles one tire for every tire sold in the U.S. through its One Team, One Planet program. Read more about Tire EPR via the Product Stewardship Institute. What is CRC doing to help solve the problem? CRC has supported Tire Stewardship legislation in Connecticut (read our testimonies from 2017 and 2018 legislation) and David Deen, our former River Steward in Vermont, was responsible for intruding tire stewardship legislation. 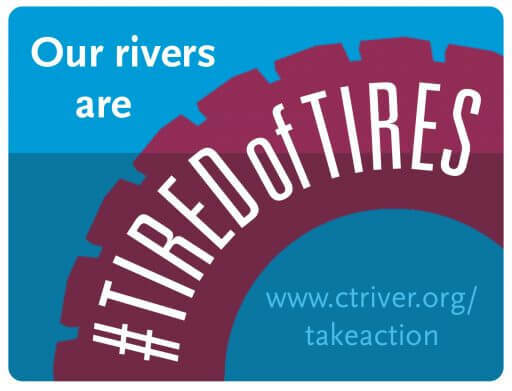 CRC will continue to work in all four states to tell our policymakers that we are tired of tires, prove that tire dumping is still a problem, and work toward better policy in all four Connecticut River states.